VATICAN CITY -- Pope Francis met the president of the U.S. bishops' conference Monday as his supporters closed ranks over the pontiff's handling of allegations of sexual misconduct by a U.S. cardinal. 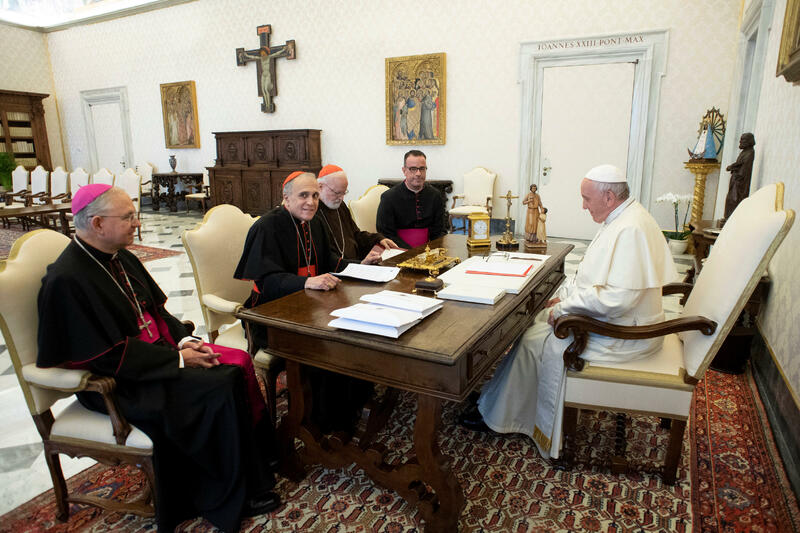 Francis held talks with Cardinal Daniel DiNardo and other senior members of the bishops' conference just 48 hours after ordering an investigation into Vatican archives concerning former archbishop of Washington Theodore McCarrick, who resigned in July. DiNardo on Sunday "welcomed" the "additional steps Pope Francis is taking to ensure the faithful are protected from the evil of sexual assault". The case of McCarrick triggered a storm in August after Archbishop Carlo Maria Vigano, a former Vatican envoy to Washington, accused the pope of ignoring allegations the prominent Catholic leader had abused a teenager decades ago. Francis was accused of lifting sanctions against McCarrick that his predecessor Benedict XVI had imposed -- charges refuted Sunday by the Vatican's prefect for the Congregation for Bishops. Canadian cardinal Marc Ouellett said Vigano's "unjustified attack" was a "political manoeuver without any real foundation" that aimed "to incriminate the pope". Ouellett said he had told Vigano in person that McCarrick "was supposed to obey certain conditions and restrictions due to the rumours surrounding his past behaviour". Pope Francis asks for prayers to protect church from “attacks by the devil"
After stepping down as archbishop of Washington in 2006, McCarrick "had been strongly advised not to travel and not to appear in public, so as not to provoke additional rumours in his regard. "It is false to present the measures taken in his regard as 'sanctions' decreed by Pope Benedict XVI and revoked by Pope Francis," Ouellett said in an open letter to Vigano. McCarrick escaped being sanctioned because "at that time, unlike today, there was not sufficient proof of his alleged guilt". Ouellett admitted that in his opinion "some suspicions provided by witnesses should have been further examined", but added that "the prelate in question knew how to defend himself very skillfully regarding the doubts that were raised about him". Francis has refused to comment on the Vigano accusation. The Vatican has said further study of the entire documentation present in its archives may reveal the church's leadership took choices that would not live up to its contemporary guidelines on tackling cover-ups. "We will follow the path of truth wherever it may lead," it said.